(BOSTON) — Scientists at the Wyss Institute for Biologically Inspired Engineering at Harvard University have devised a better assay for testing bloods clotting tendency, also known as hemostasis, which could one day prove lifesaving in a variety of clinical situations in which a patients health is jeopardized by abnormal blood coagulation and platelet function. This bioinspired advance, reported on January 6 in Nature Communications, takes a biophysical approach to assaying blood by subjecting blood samples to the same fluid shear stresses and force gradients it experiences inside a patients vascular network. It can be used with blood samples or potentially be integrated into patients blood flow lines, so that one day clinicians could have the foresight they need to prevent life-threatening events such as blood clotting or internal hemorrhaging. 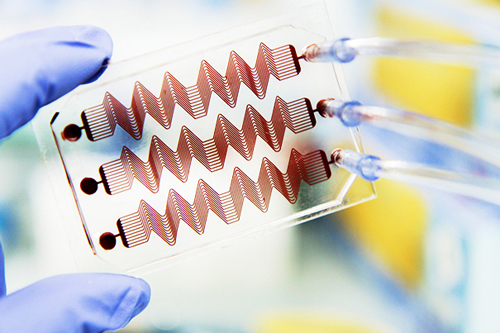 The Wyss Institute team led by Wyss Institute Founding Director Donald Ingber, M.D., Ph.D., has developed a novel microfluidic device in which blood flows through a life-like network of small “vessels”, where it is subjected to true-to-life shear stresses and force gradients of the human vascular network. Using automated pressure sensors and a proprietary algorithm developed by the Wyss team, data acquired from the device is analyzed in real-time, precisely predicting the time at which a certain blood sample will obstruct the blood vessel network. Known clinically as hemostasis, the bodys ability to stop bleeding is critical for survival. For a patient who has a blood clotting disorder or medical condition requiring the use of anticoagulation and antiplatelet drugs, or someone who requires treatment with extracorporeal devices that circulate their blood outside of their body, it is essential that care providers can rapidly monitor their bodys ability to maintain healthy hemostasis while preventing clotting. The device contains hollow channels that mimic the pathology of the narrowing of small blood vessels, which occurs in patients as a side effect of medical conditions or treatments and can often cause a shift in the fluid mechanics of blood flow that can lead to life-threatening blood clots or internal bleeds. 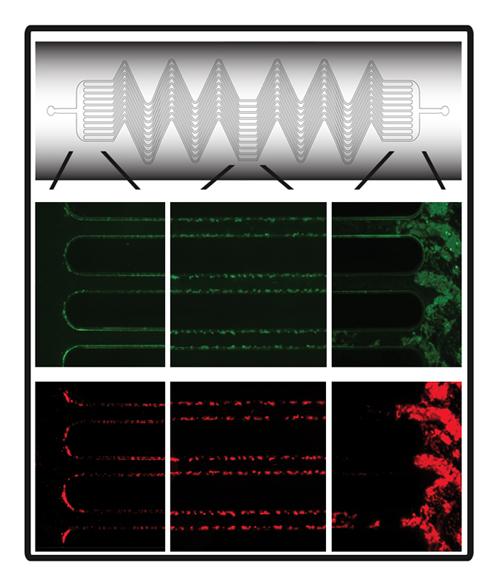 “By combining our fabricated microfluidic device that mimics blood flow dynamics of small arterioles with our novel data analysis software, we can rapidly quantitate hemostasis in real-time and predict if blood clots will develop in an individual or blood sample,” said Ingber, who is also the Judah Folkman Professor of Vascular Biology at Harvard Medical School and the Vascular Biology Program at Boston Childrens Hospital and Professor of Bioengineering at the Harvard John A. Paulson School of Engineering and Applied Sciences. Using the Wyss team’s hemostasis monitoring microdevice, blood clot formation and platelet function can be precisely monitored. The real-time monitoring ability of the device could also assess patients’ coagulation status almost continuously, in stark contrast to today’s standard of once or twice a day testing procedures, thereby reducing the likelihood of toxic side effects resulting from anticoagulation therapies. The team also demonstrated that the device can detect abnormal platelet function in patients with a rare bleeding disorder that can not be easily identified using conventional assays. The device could even potentially be used as a companion diagnostic in clinical trials to test and validate the effect of new therapeutics. In a large animal experiment already conducted, the team perfused blood directly from a living vessel into a microfluidic device to measure clinical clotting parameters over time, and they recorded precise predictions for clotting times for blood samples that were far more accurate and faster than currently-used clinical assays. The Wyss Institute’s hemostasis monitoring device has been developed with translation and versatility in mind, and it uses inexpensive in-line pressure sensors to measure clot formation. As a result, the device does not require additional instrumentation and it can be integrated directly into the blood lines of extracorporeal devices. The ability of the device to be configured for lab use or real-time patient monitoring opens the door for countless potential uses to be developed to leverage its coagulation assaying power towards improving patient care.